How do I encode a message? Is there a way to compare two decoded and/or unencoded PDUs? Is there a way to make a duplicate copy of a decoded PDU tree? How do I free up the decoder's output buffer? Is there a way to find out how much memory the BER or DER encoding of a PDU will occupy without calling the encoder directly? Does the decoder allocate memory for its output buffer automatically, or does the application developer have to do this manually? How do I decode a message? Do the OSS ASN.1 tools support canonical encoding? My application does not use floating point numbers and the configuration of the target platform does not allow floating point numbers. I understand that the OSS library supports floating point. How do I keep it from linking the C floating point library functions? Are the OSS API functions fully re-entrant and thread-safe? What is the comparative performance of the different flavors of the OSS ASN.1 tools? Can the OSS ASN.1 compiler parse any macro? Do the OSS ASN.1 tools support the CONTAINING keyword? Does the OSS ASN.1 compiler support macros and to what degree? How is UTCTime encoded in BER, DER, and CER? Is there an example that would show how to produce mixed DEFINITE-INDEFINITE BER encodings and convert primitive string type BER-encodings to constructed? Is there an example that illustrates how to produce mixed DEFINITE-INDEFINITE BER encodings? How can I decode a component of a BER-encoded PDU instead of decoding the entire PDU? If I have BER/DER DEFINITE-length concatenated unique encoded PDUs in a file, how can I use the OSS ASN.1 tools to test their validity? How do I instruct the encoder that I want to use the INDEFINITE length form of encoding when using BER? How do I instruct the encoder that I want to use the DEFINITE length form of encoding when using BER? Is there an OSS API function that can print out BER/DER/PER/UPER encodings in hexadecimal format? How do I change between the BER, DER, PER, UPER, XER and E-XER encoding rules? How do I tell the compiler to generate a long instead of a short for each OBJECT IDENTIFIER node value? I'm using the linked list representation of the OBJECT IDENTIFIER and the ASN.1 compiler is generating a short to hold the node values. However, one of the nodes has a value of 25602, which is too large to fit in a short on my platform. What is the "encoded OBJECT IDENTIFIER form"? If I provide the output buffer for the encoder, the value field of the ossbuf returned has a different address, why? If I want to use only PER or only BER, why is the runtime library the same no matter which encoding rules I use? How do I select a CHOICE component? Is it possible to compile the compiler-generated control table or code file as a DLL? OSS ships several header files. Which of them do I need to #include in my program? I received a new version of the OSS ASN.1 tools. When the same ASN.1 input file that I used with the older compiler is passed to the new compiler the generated header file is different. How do I instruct the compiler to generate the same header file as it previously generated? I used the -code ASN.1 compiler command line option. Why can't I successfully c-compile or c++-compile the ASN.1 compiler output? What is the difference between the LED (Lean Encoder/Decoder) & SOED (Space-Optimized Encoder/Decoder)? How do I cross-compile to a different platform? How can I build and use the ASN.1 compiler output as a separate DLL? What should I do if the ASN.1/C compiler output cannot be c++-compiled? How can I encode/decode concatenated PDUs to or from a file? How can I decode concatenated PDUs coming from a TCP/IP socket? How do I decode multiple concatenated PDUs when using the file memory manager? How do I decode multiple concatenated PDUs when using the default plain memory manager? Is there an example that would demonstrate the benefit of automatic encoding/decoding of open type values deeply nested in a PDU vs. manual handling? Is there a way to automatically encode and decode open types with their containing types? I'm getting a constraint error for an opentype variable. The error mentions that the size of the encoding is zero. What's wrong? Is there a way to check the constraints of a PDU without calling the encoder? How do I turn off constraint checking for all types in the PDU passed to the encoder or received from the decoder? Is there a way to export all constants from a generated control/code file built as a DLL? Is there an example that would demonstrate extensibility and the PDU safe relay mechanism? Is there an example that would demonstrate usage of ossPrintPER() and quick encoding/decoding? Is there an example that would demonstrate how to use the OSS IAAPI for constructing PDUs for encoding from scratch? Is there an example of how to access Information Object Sets using the OSS API's? Do you have a generic example which shows how to fill in values that are located in the ASN.1-compiler-generated .h file? PER bit encodings are hard to understand. Do you have a function that can print out a PER encoding in an easy-to-understand labeled human-readable format? How do I free up the encoder's output buffer? After the encoder returns successfully, what do the length and value fields of the OSSbuf instance contain? How do I pre-allocate an output buffer for the encoder? Does the encoder allocate memory for its output buffer automatically, or does the application developer have to do this manually? Is it alright to use ossEncode()/ossDecode() endlessly without calling ossterm() between each call of ossEncode() /ossDecode()? Does ossEncode()/ossDecode() free the memory it allocates by itself or does it rely on ossterm() to free it later? How do I pre-allocate an output buffer for the decoder? When calling the decoder, do I have to pass the PDU number of the data type desired for decoding or does the decoder figure this out automatically? For the decoder's output, do I have to pass the address of a pointer declared to reference the compiler-generated type intended for decoding or can it be the address of a void pointer? Is there a way to use the ossPrintPDU() function when the time-optimized runtime is in use? How do I make the OSS API functions write out data and error messages when using the time-optimized runtime? Is it possible to have the OSS API functions print to a memory buffer and not to a window or to a file? Is there a way to write trace data out to a graphical window? Is there a way to write trace data out to a file? How can I make the encoder/decoder write out detailed trace data while performing encoding/decoding operations? What are the various ways of switching the memory manager in use? Which allocated memory units do I have to free manually; which are freed by calls to the OSS API functions? I get a linker message that says a name of the form _oss_run_soed_on_xxxxxx is unresolved, where xxxxxx is a platform identifier (e.g., sparc_solaris_23). How do I get rid of this error? When I link my application, I get an unresolved symbol error about constraint functions (e.g., extern int _cnstr_by1_fn(struct ossGlobal *, msg *, void **);). How do I get rid of this error? How do I switch between the two types of runtime APIs? How do I decide whether to link my application with the static libraries or the dynamic libraries? I'm just starting out on Windows. Which library file should I link my application with to use the OSS API functions? I use DER. Do I have to know something special about the ASN.1 time types? What do I have to do to specify that I want to use GeneralizedTime? What do I have to do to specify that I want to use the UTCTime type? Does the UTC field in the GeneralizedTime structure specify that the UTCTime type is in use or that the time zone in use is UTC(i.e. GMT)? How does the encoder know whether the GeneralizedTime type or the UTCTime type is intended? Why is the same C structure used to represent UTCTime and GeneralizedTime? Does OSS provide functions to convert between the character and binary formats of values for the OBJECT IDENTIFIER type? What format do values for OBJECT IDENTIFIER types have to be in by default before I can send them for encoding? Can you illustrate how to work with the C representations for the SET OF/SEQUENCE OF type? How do I use the open type? Is there a way to encode an INTEGER value that is bigger than the largest supported integer on the desired platform? How do I work with OPTIONAL and DEFAULT components? How do I use the ANY type? What do I gain by using ossDupWorld() instead of ossinit() to create a copy of the ossGlobal structure? What are the advantages and disadvantages of using the space-optimized encoder/decoder? Do you really support distinguished encoding rules (DER) or do you support just basic encoding rules in disguise? What do I gain by using the time-optimized encoder/decoder (TOED)? What do I lose? Is there a way to improve the runtime performance of the OSS API functions? Is there a way to make a duplicate copy of an initialized ossGlobal structure? Why do I get error 18 from ossinit()? What are the OBJECT IDENTIFIER values that are allowed by the standard and how are they encoded? Why does the decoder issue error message D0023E about the INTEGER or ENUMERATED value being too long? How is the Lean encoder/decoder (LED) different from the regular API? Is it possible to easily switch between the two encoder/decoders without changing my code? Why was the default representation for size-constrained OCTET STRING values changed to UNBOUNDED instead of VARYING as before? Why does the encoder encode only the second and subsequent elements of a SEQUENCE OF value? How can I encode/decode a huge SEQUENCE OF field of a PDU using files instead of keeping the entire unencoded/decoded PDU in memory? Why do I get _oss_run_SOED() or _oss_run_TOED() as an unresolved external symbols when I am trying to link? Why do I get a memory violation when I call ossFreePDU() on an unencoded PDU that I construct for the encoder? Why do we get some memory leaks when using the encoder/decoder? What is the maximum memory size that the encoder allocates internally? Does it allocate more memory than the size of the encoded data returned? I am having problems using the time-optimized static library, toedcomd.lib. What might be wrong? What is the significance of using the VC++ compiler options /MT vs. /MD? Why is OSS.LINKED not supported for BIT STRINGs in TOED (time-optimized encoder/decoder)? Should I call ossCpyValue() if I need to place the decoded PDU in my buffer? What should I do if the encoder crashes or returns a non-zero code? What is the difference between the IAAPI and the basic encoder/decoder API? Do I have to call the ossinit() and ossterm() functions for each thread in use? I previously implemented my application using an older version of the OSS ASN.1 Tools, and now I have to upgrade it to a more recent version. However, when I compile ASN.1 files using the new version of the ASN.1 compiler, some names are generated differently from those generated previously. What can I do to have the compiler generate the same names as it did in the previous version? Is the -noUnique option synonymous with -noUniquePDU? Can I abbreviate command line options? Is there a simple example of using an ASN.1 macro? Is there an OSS ASN.1/C example for the RANAP protocol? Is there an OSS ASN.1/C example for the protocols ROS+H.4501+H.323+H.235+H.225? Is it possible to extend Information Object Sets in RANAP, RNSAP, NBAP, etc.? Is there an OSS ASN.1/C example for the NBAP protocol? Is there a complete ASN.1-compilable example of the GR303-IMD protocol? When using ossEncode() with a pre-allocated buffer, it seems that which way the buffer fills vary depending on the encoding rules (PER or BER) that I use. Is that true, and what determines where the buffer fills from? Does the OSS API use OSE functions alloc and free_buf for memory handling or are they set to malloc and free? Do the encode/decode functions ever use realloc? If I compile and run my application using the space optimized encoder/decoder (SOED), it correctly reports an unknown record type, but the time optimizer (TOED) simply returns a value!= 0. Unfortunately, I need the time optimizer. Is there any way the Time optimizer compiler can handle this? I am creating a simple application that uses ossEncode/ossDecode. Which library should I link with my application? I'm developing a MFC-based application with the /MD (/MDd) compiler option and because of that I use the osscppmd.lib and cppsoedmd.lib OSS static runtime libraries. I am having problems linking the application. How can I write runtime trace information to a buffer instead of to the screen? What is the minimum number of OSS DLLs that I need to ship with my product? 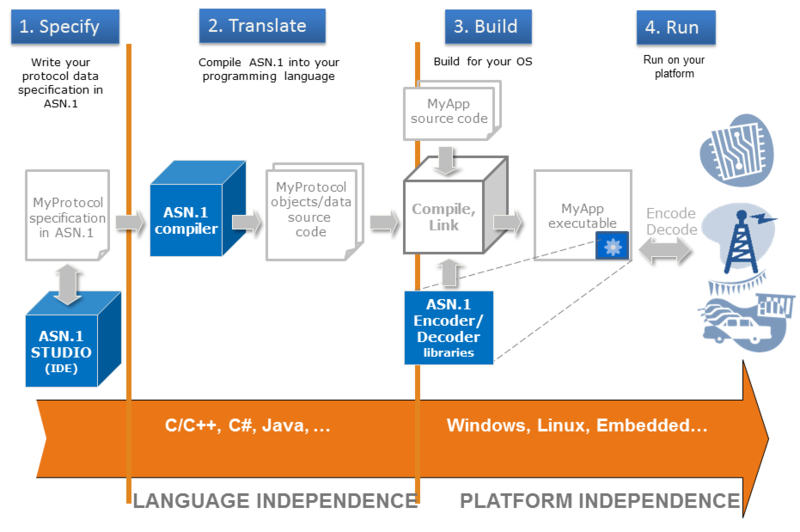 Do you have a sample application that illustrates step-by-step the use of the OSS ASN.1 Compiler to compile a simple ASN.1 module, and the use of the OSS C API to invoke the encoder/decoder? Do you have a sample application illustrates the use of the OSS ASN.1 Compiler to compile a simple ASN.1 module, and the use of the OSS C runtime APIs to invoke the Extended-XER (XML) encoder/decoder? What's the difference between the ASN.1/C SOED/TOED/LED runtimes? Is there a way to use multiple ASN.1 protocols in the same program and to add a new protocol on the fly without rebuilding the program?